A Bejeweled clone for touchscreen phones. Not playable on non-touchscreen phones. Tap groups of 3 or more fruits to smash them and make them disappear. Clear all the fruits to advance to the next level. 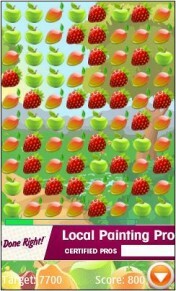 The app “Fruitito” (496 KB) is ready to download or send to your phone as filename:”fruitito”. why I can not download this game? Either you have no data or an incompatible phone. Android phones only run Android apps and games. There are over a million Android apps in the Google Play Store. There are no Android apps on BoostApps. Apps on this site are for basic phones (aka feature phones), they don’t work on Android. Use the Android Play Store to get Android apps and games.